Looking for a top-shelf, high-energy music that is wildly entertaining and also truly appropriate for the whole family? 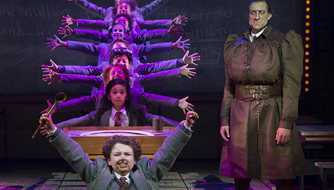 Look no further than Matilda – The Musical. Beloved children’s author Roald Dahl’s Matilda character (Lily Brooks O’Briant) is an uber-brainy 5 year old girl regarded as an annoyance and embarrassment by her shallow, self-absorbed parents. School is another nightmare, ruled by the monstrous Agatha Trunchbull (David Abeles). Brave little Matilda’s only refuge is the local library, where she devours weighty classics with ease while mesmerizing the librarian (Ora Jones) with a serialized tall tale she appears to be making up as she goes along. When compassionate teacher Miss Honey (Jennifer Blood) recognizes Matilda as a prodigy, conflict arises and the little girl must find strength she’s never known herself to possess. Though clearly older than five, O’Briant is consistently winsome and forthright, driving the show in many stretches and a solid singer in her solo numbers. As Matilda’s comically awful, un-doting mom and dad, Cassie Sylva and Quinn Mattfield get big laughs and would deserve a spin-off series of their own, if this were TV. Jones adds an earthy West Indian flavor to her librarian, and Blood shows a nice arc as she goes from mousey and “pathetic” to a firm-chinned advocate for the children. But it’s Abeles as the loathsome school principal who steals the show with a searing, sneering presence that’s both malevolent and hysterical. So was it perfect? Nearly. Some ensemble song lyrics were hard to understand on opening night. And while the setting is ostensibly England, only the adult actors affected British accents. A directorial choice that didn’t harm anything, but it did raise an eyebrow. Pish-posh, as the Brits might say – now I’m nitpicking. May 1 ends this lovely run far too soon.